If you are interested in making money online and have heard about paid surveys, you have maybe seen ads for TakeSurveysforCash.com. But is Take Surveys for Cash legit or is it a survey scam to stay away from? I have used paid survey sites for years, and I can quickly tell whether a survey site is legit or not. 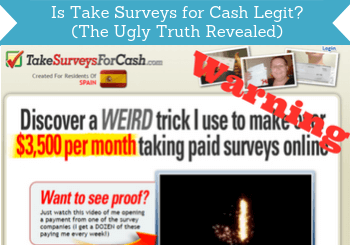 In this review of Take Surveys for Cash, I will show you why you have to be very careful about joining this site. Make sure to read all the details about what it truly offers below, so you are sure you know, what you are getting into, and do not end up feeling like you are wasting time and money. What is Take Surveys for Cash and what does it offer? Take Surveys for Cash promises to teach you the secret trick to make thousands of dollars every month by doing easy, short, paid surveys. By becoming a member of the site, you will get to know this trick and be able to start making a lot of cash today. More precisely, the site claims that by joining, you will be able to easily make over $3,500 a month with very little effort. There are several other sites that make similar claims, for example a site like Click 4 Surveys that I have previously reviewed. This does however not make the claims true. It is always a warning sign when a system promise you can make thousands of dollars very easily. This is not only a warning sign with paid survey sites, but with any program that promise you can make a living online with more or less no effort. But more about the warning signs later. Take Surveys for Cash does not only promise you to make thousands of dollars every month. You are also told you will get $50 bonus, as soon as you have taken your first survey. This sounds very good, and who is not dreaming about being able to make this kind of money with very little effort from wherever in the world, you are. But I am sorry to say – this is NOT realistic. You will maybe get access to a list of paid survey sites, but there is no need to pay for becoming a member to get a list like this. It is easy to get access to paid survey sites without having to pay to become a member. 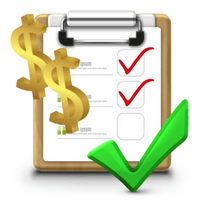 You can for example check out the top 10 list of paid survey sites, that you can join for free. There is no secret trick to make that kind of money doing surveys – it is simply not realistic. It is definitely true that you can make some extra money doing surveys, and I am doing that myself, but not that kind of money. As you can probably already understand by now, I am not a big fan of TakeSurveysForCash.com. Let me go a bit more into details about how you can see this is a site you have to be careful about joining. Take Surveys for Cash lives up to more or less all the signs you have to be careful about joining a survey site. No legit survey site cost money to sign up for. There is absolutely no need to pay for a membership to a site that will give you access to paid surveys. It is a waste of money. I really dislike when I see sites trying to get you to pay to get access to a list of survey sites. It should never cost money to get access to this, and all the big survey sites are free and will warn you against ever paying yo get access to any surveys. The price is also well hidden on the site. You can actually not see it anywhere at first. You read all the appealing info and decide to join by putting in your email and name. Not until after that, you will see that it costs money to join ($39, but after extra fees it will end up being around $48). If you then decide, you do not want to pay, the site already has your email address and can send you follow-up emails to try to convince you. And it will – you will continuously receive emails from the owner Jason White, with extra offers and reminders. In my opinion that is a dirty trick not to reveal the price right away and is definitely a red flag. When you are on the site, you will see a promise that you will get a bonus of $50 dollars once you have completed your first survey. You can maybe on rare occasions find a survey that will pay you this amount, but it is very rare, and survey sites will in general never give you this high a joining bonus. Cleverly enough the promised bonus, is exactly enough to cover your initial investment for your membership. So a great way to get people to join and pay, and think they are doing it without any risk. You will also be promised an additional monthly bonus after giving your email. As you can see on the picture, I was promised a short vacation worth almost $700 just for joining. That would be the most amazing joining offer ever, in any business, if this was true. Again this is a completely unrealistic claim and promise just to get you to pay and join. On the site you will see that it is a guy called Jason White who is behind Take Surveys for Cash, and who has apparently discovered the secret to make a good living online by taking short surveys. There is however no information to be found about who he is, other than he is a self proclaimed king of paid surveys. Whenever there is no information to be found about the owner and no contact information, it is a clear sign that something is iffy. You do not see any picture of him. You just hear a voice that sounds very much like a TV speaker. So ask yourself if you really want to learn the “secret” to make money online from a guy you do not even know who is, and who on the website provides no real information about his background. Taking surveys is probably the easiest way to start making money online, and you will start earning a profit from day one. So it is definitely a legit way to make money. But you will only be successful, if you do it with the right expectations. You can definitely make some nice extra money on paid surveys, but not a full-time income. Take Surveys for Cash for cash claims that you can easily make $3,500 a month by using the weird trick Jason will teach you. Take Surveys for Cash claims you can make a full-time income on the site. If a site claims you can make this kind of money by joining them, you should be very suspicious – especially when they at the same time want you to pay to join. It is simply not realistic to make this kind of money on surveys, and as already mentioned, you should never pay to join a survey site. The big selling point on Take Surveys for Cash is that the self proclaimed king of paid surveys Jason White will teach you the secret trick that no one else know. The site also mentions that usually you will not be able to make this kind of money on paid surveys, but Jason has discovered a trick. Sorry to disappoint you – there is no secret trick to become rich doing surveys. And you should not trust anyone who tries to convince you that they can teach you how to make this kind of money doing surveys – especially not when you have to pay them to teach you this trick. When you first enter the site, you will right away see a little video about a person showing proof of a big check received for doing surveys. The video even claims that the $500 check that is shown was made doing a survey that took just 2 hours. For me it is not a proof that Jason actually gets paid this amount, but more a proof that the site is trying to use tricks to convince me to join. The “proof” that Take Surveys for Cash pays. When you read all the info on the sales page of Take Surveys for Cash, you might think that you are guaranteed to make this kind of money, if you join. But if you check the disclaimer, you will see that no guarantee is made. The disclaimer reveals there is no guarantee you will make any money. as you can see from the highlighted part of the image above, Take Surveys for Cash does not guarantee you will make any money. I know that for legal purposes more or less any website need a disclaimer like this, but it is still important to take into consideration. The system is not bulletproof, and you are not guaranteed to make any money by joining. So if you got that impression from the sales page, the disclaimer reveals that is not the case. Can I make money on Take Surveys for Cash? Even though Take Surveys for Cash in my opinion and experience will likely not live up to its promises, it is actually possible to make money on the site. You might receive a list to some surveys sites, but you can find that many other places for free, and it will not make the amounts the site claims. But you can actually end up making quite a bit of money on the site’s affiliate program. That means that you can get paid to invite other people to join the site. You will get paid 75% of the joining fee for every person, you refer to the site that ends up joining. So if you do not mind convincing people to pay to join a survey site that will likely not give them what the expect just to make a bit of profit yourself, then it is possible to make money on Take Surveys for Cash. But in my opinion, this is not a recommend route – it will not set you up for long term success and good relationships. If you want a more honest approach to make money online, there are luckily also other ways. Are there other ways that are better to make money online? If you want to make money doing surveys that is definitely an option, and there are many legit sites that offer this for free. Just be aware that this will not make you rich, but can give some nice extra cash on the side. I personally really like paid survey sites, as it is a great and easy way to earn a bit extra money, and at the same time have your opinion heard on important topics. You just need to do it with the right expectations – then it is a great option. To get the best start, you can click the link below to see the top paying survey sites in your country. If you not interested in just making some extra money, but want to be able to make the amounts Take Surveys for Cash promises, that can definitely be done online. But not by doing surveys. You can for example do this by building an online business. It will take some effort and dedication, but it can be very fruitful, and you can build a business based on your passion or any topic you like. So if you are willing to put in a lot more work, and are willing to take some time to build up a full-time income online, you can click the link below to read about my recommended way to do this. As you can understand from the above, Take Surveys for Cash is not a survey site I think is worth joining. But let ‘s sum up the pros and cons to give you a better overview before deciding, if it is for you or not. I honestly do not think Take Surveys for Cash has any pros. It is true you can make money by taking online surveys, but in my opinion it will be a waste of your money and time to try to do it through Take Surveys for Cash, and it will never be able to make you the money it claims. Depending on what your goal is and what you are interested in, you can instead check out the two links above to read more about my recommended ways to earn online instead. I hope this review have given you are clear idea about what Take Surveys for Cash really is and what it offers, so you now know what you are getting into, if you decide to join, and can make a decision based on this. If you have any comments, questions, or have any experiences with Take Surveys for Cash yourself, I would love to hear from you in a comment below. Take Surveys for Cash makes a lot of (exaggerated) promises, and is a site that will charge you for a service that is not worth the money at all. So better to find another site to join, if you want to make money online by taking surveys. It seems like there are more paid survey scams or wastes of time than there are legit ones. But there are some legit ones and I appreciate you for listing them and warning us about a very bad one. I personally have used a few survey sites and was able to make a couple extra bucks to help accelerate my mortgage so going with the legit ones pays off. Unfortunately there are many survey sites to stay away from. But luckily there are also many great ones, where you can definitely make some extra cash. Glad you have also managed to find some of the legit ones. I have tried numerous times over the years to “take surveys’ for extra income. It always ends badly and causes undue frustration and angst about trusting anything online again. I appreciated your article and agree there are potential opportunities, but they are likely not going to make you a ton of extra money. Thanks for your comment Eric. It is a shame that there are so many scams out there that makes us suspicious about trying to make some extra money online. Unfortunately, we have to be aware not to be cheated, and to avoid sites like Take Survey for Cash, that are just trying to get money out of us withint giving what they promise in return. But luckily there are, as you say, also many good opportunities, both when it comes to paid survey sites and other ways of making money online. Thank you for the very detailed review. I liked you clearly indicating the red flags of the program and all of them did seem to me as scam alerts. There were times when I was also interested in surveys but as I am from Europe (small country in Europe) I couldn’t get any survey offer as noone is interested in opinions of inhabitants of small EU country. So I had to find other way of making money online and this is when I found Wealthy Affiliate – the most advanced platform for online marketers to run successful online business. I highly recommend it to anyone wishing to make honest money. Thanks for your comment and for sharing your experiences Arla. I myself is actually also from a small European country (Denmark), and here there are plenty of chances to do surveys online. Not as many as in certain other countries, but there are still many. So if you find the right survey sites, there is a good chance there will also be some for you. But great to hear that you have found another way to make some money online as well.